Do brine or not to brine? In my opinion, brining is worth it – all you need is time. Follow these steps, and you will have an unfailingly moist and flavorful turkey with a crisp and crackly skin. My favorite way to make a turkey is to brine it – not dry brine, but in a liquid, for 24 hours. Then I remove it from the brine and let it sit uncovered in the refrigerator overnight to dry out. This ensures that the skin will not be soggy, but sufficiently dry of moisture so that it will roast, or in this case grill, to crispy perfection. Before roasting, I allow it to sit at room temperature for 1 hour, to ensure even cooking, and then I roast it on the grill. The grill? Yep. Not only am I partial to my gas grill for all sorts of cooking, I only have one oven. So when the holidays roll around and the kitchen and its appliances kick into overtime, I rely on my handy outdoor grill to step in for roasting. It’s simple to do over indirect heat, much like the indirect heat of your oven. Just pay attention to the temperature, and rotate the turkey for even cooking. The added bonus is that the grill will burnish your turkey a gorgeous mahogany color, a hue I have never achieved in my kitchen oven. So there you have it. The turkey pictured is a 20 pounder, but generally, I roast a 16 to 18 pound bird. My family and I don’t like stuffings, so I fill the cavity of the turkey with handfuls of herbs, a quartered onion, and a quartered lemon, while taking care not to pack in too much. Once the turkey has finished cooking and while it’s resting (for at least 30 minutes) I remove the herbs and wedges and replace with a fresh bunch of herbs for decoration before carving. This step is necessary in order to show off the gorgeous results – and, boy, are they gorgeous. So, go ahead and work these simple steps into your pre-Thanksgiving plan. You can do one step a day: Begin on Monday with the brine and finish with grilling on Thursday for a spectacular Thanksgiving turkey. It’s worth it. To brine the turkey, you will need enough space in your refrigerator for a container large enough to hold your turkey submerged in the brine. This can be cumbersome, but it’s worth it, in my book. I have used a plastic storage box in the past, but now rely on a cooler, in which I pour the brine directly to cover the turkey. I then leave the cooler outside overnight (note: this is only practical if the outside temperature is as cold as your refrigerator). 1. Make the brine: Combine 1 to 2 quarts water, the salt, onion, sage or rosemary, garlic, bay leaves, peppercorns, coriander seeds, and the orange zest in a large stockpot. Bring to a boil, stirring to dissolve the salt. Remove from the heat and add the remaining water and the cider; cool thoroughly (or chill overnight). 2. Brine the turkey: Place the turkey in the brine. If not fully submerged, then add more water to cover. Refrigerate overnight. 3. Air-dry the turkey: Remove the turkey from the brine and pat dry inside the cavity and outside. Place on a rack in a large roasting pan and refrigerate for at least 8 hours or overnight. 4. Grill the turkey: Remove the turkey from the refrigerator 1 hour before roasting or grilling. To grill: Prepare the grill for indirect cooking over medium heat (325°F). Grill until thoroughly cooked, rotating the turkey every hour and basting every 30 minutes or so with pan juices. Allow to rest for at least 30 minutes before carving. This is a Sunday soup (or, in this case, a Tuesday soup). It’s a perfect antidote to a long holiday weekend punctuated with big meals and late evenings. It’s restorative, healthy, and nourishing and a perfect time-out meal to enjoy on a relaxed evening with no social agenda. It’s also a simple way to use some of that leftover turkey lurking in your fridge. If you don’t have turkey, fear not, chicken works just as well, so if you’ve soldiered through your Thanksgiving leftovers you can easily use cooked chicken meat or a rotisserie chicken from your local store or farmer’s market. That’s why I often call this a Tur-Chicken soup. There are two important ingredients I like to add to this soup. Shiitake mushrooms impart a slinky umami flavor to the stock, and farro, an ancient nutty wheat grain, lends satisfying heft to each slurp. Use pearled or semi-pearled farro for easiest cooking. Whole grain farro, while the healthiest option, requires soaking and a long cooking time of at least one hour, and has a distinct earthy flavor. Milder semi-pearled farro still retains some of its nutritious bran and germ but is scored to hasten cooking, and pearled farro is completely stripped, thus the least nutritious, but quickest to cook. If farro is not available, pearl barley is a good substitute. Heat the oil in a soup pot or Dutch oven over medium heat. Add the onion and sauté until it softens without coloring, about 3 minutes. Toss in the carrots and mushrooms and sauté until the carrots brighten in color and the mushrooms begin to release their juices, 3 to 4 minutes. Add the farro and cook briefly, stirring to coat and lightly toast the grains, and then add the stock, thyme, and bay leaf. Bring to a boil and then reduce the heat to medium-low. Cover and simmer until the farro is tender, 30 to 40 minutes. Stir in the chicken (or turkey), salt, and pepper and top off with additional stock if needed. Simmer until the chicken is heated through. Ladle the soup into bowls, and serve hot, garnished with the parsley. 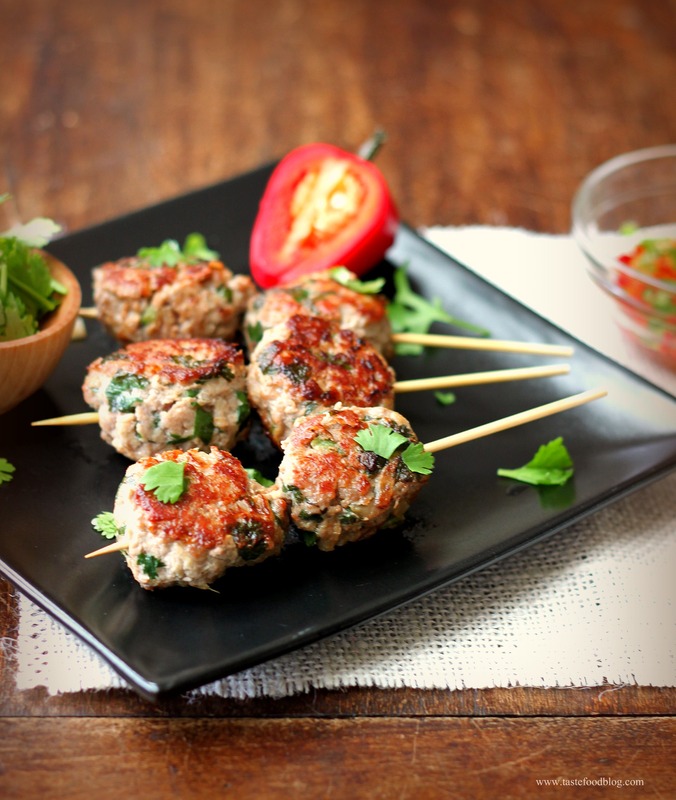 If you are anticipating a holiday food hangover this season, then take note of this recipe. 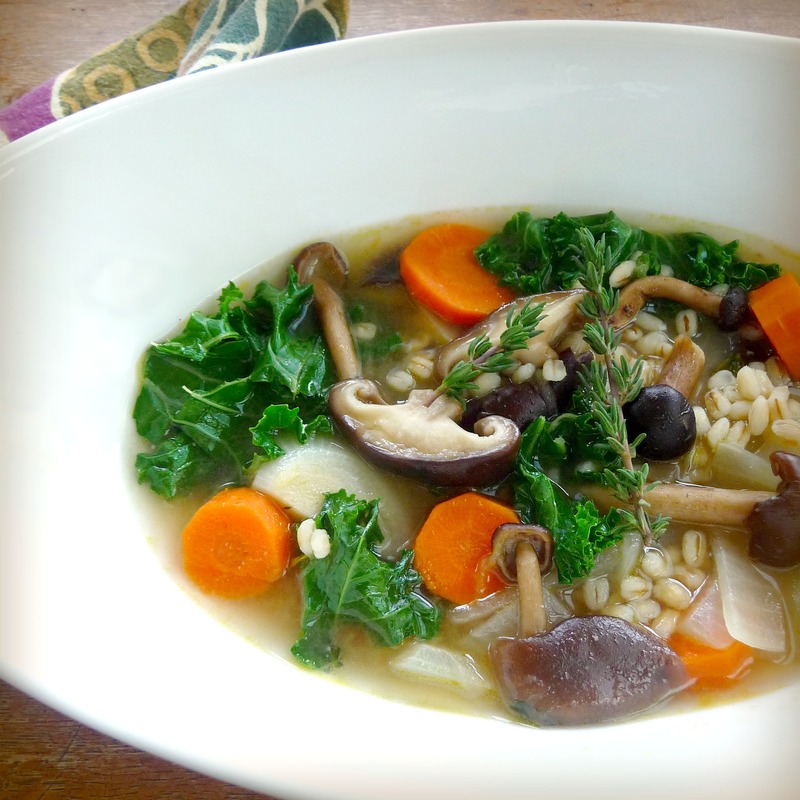 Mushroom Barley Soup with Miso and Kale is the perfect antidote to excess. Not only does it put to use any left over turkey stock you may have, this healthy, economical soup is loaded with vegetables and high fiber barley. Handfuls of nutrient-rich kale are added to the soup in the end, so there is just enough time to wilt the leaves without overcooking. The extra ingredient to this wholesome soup is a spoonful of red miso paste, which adds depth and that elusive umami quality which keeps you coming back for more. Luckily, this is one meal you can indulge in seconds without feeling guilty. Chicken stock may easily be substituted for turkey stock. Serves 4-6. Heat oil in a medium sized stock pot over medium heat. Add onion and 1 teaspoon salt; sauté 2 minutes. Add mushrooms and carrots; sauté 3 minutes. Add barley and thyme and stir to coat. Add stock, bay leaf and pepper. Bring to boil, then reduce heat and simmer, partially covered, until barley is tender, about 30 minutes. Stir in kale. Simmer until kale turns bright green and wilts, 2 minutes. Remove from heat and stir in the miso. Taste For seasoning. Serve garnished with fresh thyme. I posted this recipe last year between Christmas and New Year when I suffered a food hangover and needed a gastronomic time-out. This soup was the perfect antidote: simple, healthy and fortifying. It handily uses the leftovers from a holiday turkey dinner, adding a satisfying economy to the pleasure of this meal. The broth is clean and light and packed with chunky vegetables. Swiss chard is added at the end for extra depth. During the ever-so-festive excesses of the holiday season, we all need a comforting and restorative dish like this in our repertoire. 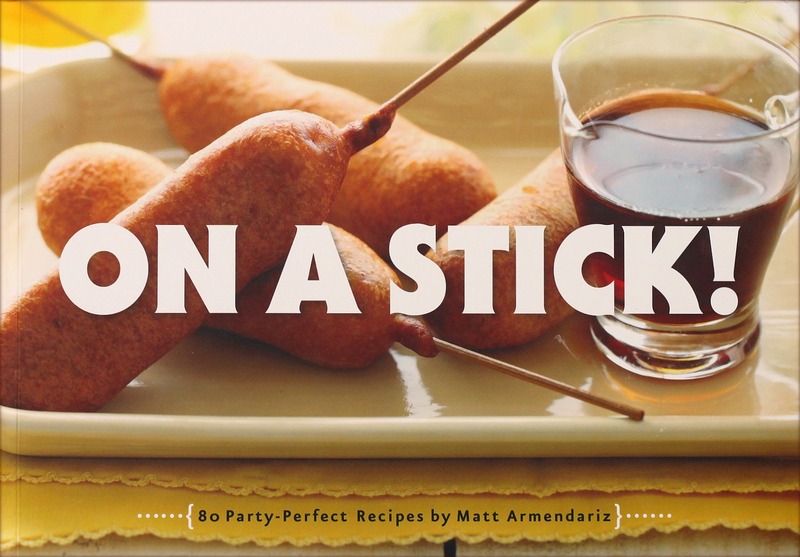 Consider this recipe an early holiday gift from me to you. Happy Thanksgiving! Try using red Swiss chard – it adds a lovely red hue to the stock as it cooks. Heat olive oil over medium heat in a large pot. Add onion, carrots and celery. Sauté over medium heat until the vegetables brighten and begin to soften, about 3 minutes. Add turkey stock, bay leaf and thyme. Bring to a boil and simmer, partially covered, until vegetables are tender, about 20 minutes. Add salt and pepper to taste. Stir in Swiss chard and turkey meat. Simmer until chard is wilted. Discard bay leaf. Serve immediately. Place all of the ingredients in a large stockpot. Cover with water. Bring to a boil, and simmer, partially covered, 2-3 hours, occasionally skimming any fat. Remove from heat. Carefully drain in a colander placed over a large bowl or saucepan. Strain again through a fine meshed sieve. Cool. Stock can be refrigerated up to 3 days or frozen up to 6 months. I am going to slip this recipe right in. Flanked by a Christmas Eve house party with lots of gløgg and hors d’oeuvres and a looming New Year’s black tie dinner, I made this simple, healthy and restorative soup the other day for a gastronomique time-out. In addition to a Christmas Eve party spread of food, we roasted a turkey for our Christmas Day meal. It may sound redundant on the heels of Thanksgiving, but for Thanksgiving this year we were graced with airport and airline food as we were in transit home from a trip to New York City. While we missed the traditional holiday, it was refreshingly civilized at JFK; we enjoyed a smooth glitch-free day of travel courtesy of the Thanksgiving holiday. We comforted ourselves with the thought of saving our turkey binge for Christmas Day, instead. So, back to the recipe: I made this soup using the stock I made from our Christmas turkey, and filled it with vegetables left over from our party. While the recipe calls for turkey stock and turkey meat, chicken can easily be substituted. During the ever-so-festive-and-excessive holiday season, this homey soup is delicious, comforting and healthy. I cannot think of a better gastronomic time-out. The chard adds heartiness to this flavorful soup. Choose either red or green chard; you will find the red chard will add a deep red color to the stock. Heat olive oil over medium heat in a large pot. Add onion, celery and carrots. Sauté over medium heat until the vegetables begin to soften, 3 minutes. Add turkey stock, bay leaf and thyme. Bring to a boil, and simmer until vegetables are tender, about 20 minutes. Add salt and pepper to taste. Stir in Swiss chard and turkey meat. Simmer until chard is wilted. Discard bay leaf. Serve immediately.